At this level, you are already familiar with most of the fundamental Korean sentence structures and grammar rules. 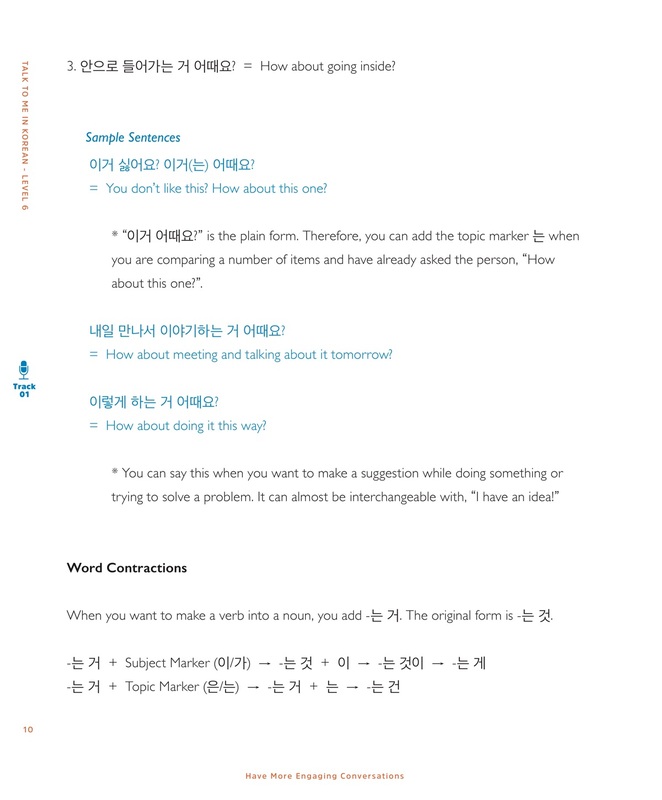 With this grammar textbook, however, you will learn how to make your Korean sentences even more specific and detailed by adding extra elements to them and emphasizing certain parts. As you must be well aware by now, the key to improving your Korean even more from now on is by practicing a lot. You can also try to express the same idea in various new ways instead of just sticking to the expressions with which you are comfortable. The chapters in this book will help you learn new tools that you can use in forming new types of Korean sentences. We hope you enjoy learning with this book and improving your Korean sentence-building skills even further. Thank you very much for studying with Talk To Me In Korean and also, congratulations on your determination to continue learning! 이 책도 여러분에게 많은 도움이 되었으면 좋겠습니다. 앞으 로도 저희 톡투미인코리안 교재들로 즐겁게 공부해 주세요! 1. How about...? / 어때요? 2. What do you think about...? / 어떻게 생각해요?, 어떤 것 같아요? 4. Do you mind if I...? / -아/어/여도 돼요?, -아/어/여도 될까요? 12. What do you mean?, What does that mean? / 무슨 말이에요? 29. Sometimes I do this, but other times I do that. / 어떨 때는 -(으)ᄂ/는데, 어떨 때는 -아/어/여요.